Bimmerfest, the longest running BMW car show in the Philippines now on its 13th year. Held by the BMW Car Club of the Philippines, the event is entitled “Bimmerfest XIII” and will be held on December 10, 2016 from 10:00am – 10:00pm at Capitol Commons in Pasig City. The event is open to the public – admission is FREE. For further inquiries, contact PMCM Events at +63.917 834.4978 or Linea Fiori Events at +63.949 759.7216. 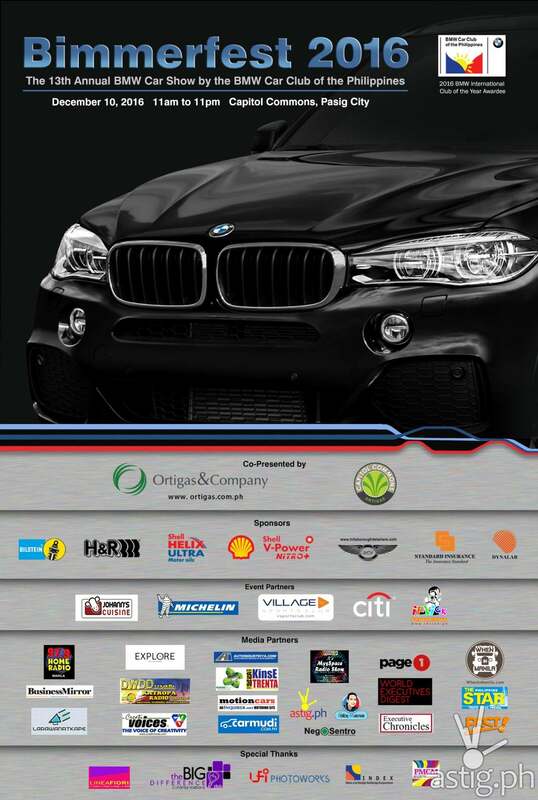 The 13th edition of “Bimmerfest” is brought to you by the BMW Car Club of the Philippines, Shell V Power Nitro, Shell Helix Ultra, Bilstein, H&R, Standard Insurance, Dynalab and Hillsborough Car Spa. It is co-presented by Ortigas & Company / Capitol Commons.